Have you ever wished you could go back and redo something? Maybe you messed up on a test in school or a task on your job. Perhaps you said something you wish you could take back and say the right thing instead. Sometimes it would be nice if we could rewind our lives and get a second chance. In the book of Romans, the apostle Paul argued persuasively that Jesus Christ alone can cancel a person’s past. Because of what we celebrate on this Easter Sunday, the death and resurrection of Jesus Christ, new mercies are available to us each and every day. The Savior was sent so that you and I could begin again, with a fresh start. Join us on Easter Sunday for REBOOT and learn how you can receive grace from a God of second chances. Kid City worship for grades 1-6. Childcare is provided for infant thru kindergarten. The Iron Men Conference is foused on helping men to become better fathers, husbands, sons, and leaders. Iron Men Conference seeks to build Christian leaders out of men, in their communities, their workplaces, their churches and most importantly, their homes. Iron Men is worship, praise, fellowship, food, and the word of God spoken by engaging Christian leaders. Iron Men is focused on Bible based teaching and worship. It is designed as a Christian conference first and a men's conference second. We know you have a lot on your plate. That's why we created Iron Men with a man's schedule in mind. Bring your friends, soak it all in, have a good time, and be home for church on Sunday. Whether you have two people coming or a group of 50, this will be a life-changing 24 hours. The cost to attend Iron Men Conference is $65 per person (before June 2), and $75 per person (after June 2). Cost includes admission to all sessions, conference materials, breakfast buffet and lunch on Saturday. T-shirts, hats and other merchandise will be available for purchase. Group discounts are available to churches registering 10 or more. This is the second annual Fearless Ladies Conference in Cooper City Church of God. A gathering of ladies from all walks of life joining together as fearless daughters of the King, who are not moved by the world for her God is with her and goes before her. She does not fear because she is His - and one day she discovered that she was fierce, strong, and full of fire. She is Fearless. The Fearless Ladies Conference is hosted by Cooper City Church of God and Pastor Cindy Harris. The weekend will feature uplifting praise and worship by Bernard and Jai Rose Harris. This two day event is on Friday, October 4 @ 7pm (doors open at 6pm) and Saturday, October 5 @ 9am (door open at 8am). 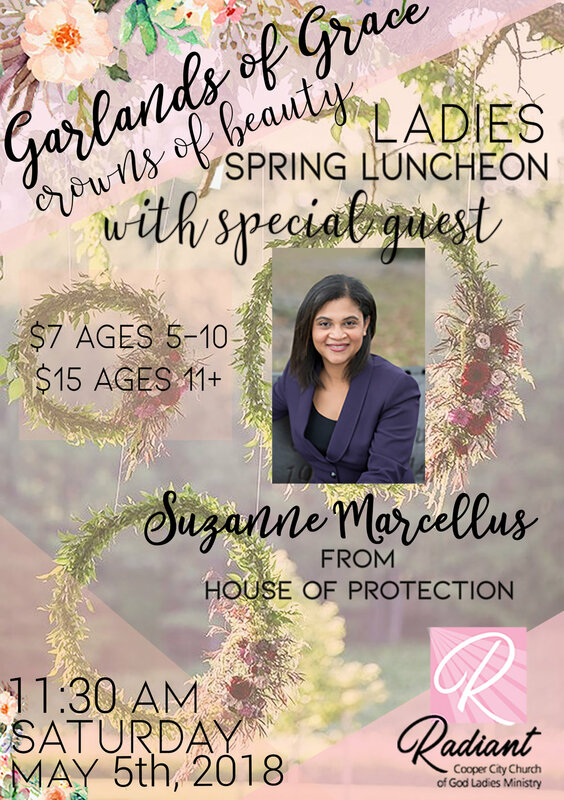 Ladies of all ages are invited to be a part of this event. Childcare for children 5yrs old and younger is available for Friday ($10) and Saturday ($15 lunch included) but it is limited. Registration link will be sent after ticket purchase. As daughters of the King, we’re chosen to live fearless lives for Him. Make your plans to join us for this exciting weekend on October 4 & 5, and discover how fearless women can change the world. Join us for the EGGSTRAVAGANZA at the Cooper City Sports Complex on Saturday, April 20 at 9am. Baskets will be provided courtesy of Memorial Healthcare Systems. Don't forget to bring your camera to take a picture with Peter Cottontail. The event is for toddlers (must be able to walk) to Fifth Graders. 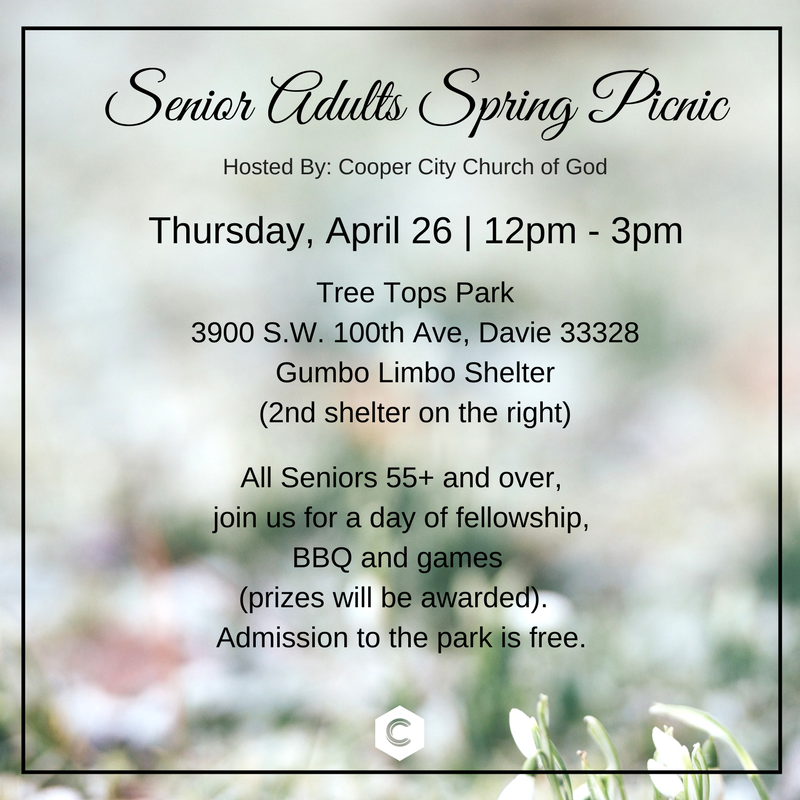 Cooper City Church of God is a sponsor and we invite everyone for this community event. Good Friday is a time when we join Christians of many generations throughout the world in using the liturgy of Tenebrae or service of shadows. Tenebrae is a prolonged meditation on Christ’s suffering. Readings trace the story of Christ’s passion, music portrays his pathos, and the power of silence and darkness suggests the drama of this momentous day. As lights are extinguished, we ponder the depth of Christ’s suffering and death.The service is designed to cause everyone to reflect on the power and the necessity of Christ’s crucifixion. Childcare is provided for infant thru kindergarten. Join us for the 2019 MISSIONARY APPRECIATION WEEK at Cooper City Church of God. Worship and special music will be shared by the Cooper City Church of God Celebration Worship choir, orchestra, worship team and dancers. This evening will be an energetic kickoff focused on our goal of engaging the next generation with the heart for missions. Worship and special music will be shared by Kaci Stewart and other guests. This evening will be focused on our goal of expanding our reach in the 10/40 window. Speaker and musical guest: Jason Crabb, GRAMMY and 21 time Dove Award winning vocalist. Worship, special music and teaching will be shared by Jason Crabb with live band and other musical guests. Doors open for nightly worship experiences at 6:30pm. VIP seating will be reserved for all missionaries and their families. All other seats are open seating. Worship and special music will be shared by the Cooper City Church of God Celebration Worship choir, orchestra, worship team and dancers. Teaching and additional special music will be provided by our missionaries. 2019 is quickly approaching and we want to invite YOU to celebrate the ending of 2018 with us in Cooper City Church of God. Reggie Dabbs will be hosting and leading music by saxophone. Join us on New Year's Eve at 10:30pm and bring a friend. Don't miss this night of praise into the New Year. Children of all ages get excited to unwrap their presents each year at Christmas. Joy and laughter fill rooms everywhere as bows and packaging are removed to reveal the gifts inside. And yet, a gift that was given to all mankind centuries ago is often left unopened. This Christmas, come discover the gift of God’s Presence. It is the greatest gift of all. Join us through out the month of December for our series “Christmas Presence”. Kid City Production presents "In Search of a Hero"..... A journey of a young boy that is tired of being bullied and goes on an journey to find a Hero to help him. Our Kid City Kids are kicking of the Christmas season on Sunday, December 2 8:30am | 11am. This production includes music, fun and a heart warming message for all to experience. Invite your family and friends of all ages to be a part of Johnnie's journey, "In Search of a Hero." On Wednesday, November 21 at 5pm, you will be able to tune into an online Thanksgiving worship experience. This is a reminder we will not have any Wednesday night worship, activities, groups or Kid City / CC Youth services. We will upload the link right here so you are able to worship with us. The link will also be available under our Wednesday Night web page cccofgod.org/wednesday-night/ , our Church facebook page facebook.com/cccofgod/, and our church app ( go to your app store and search “Cooper City Church of God”. Happy Thanksgiving and we hope you al enjoy this time with your family and friends. Disciples of Christ invites all men to the annual retreat. The men's retreat is a time of worship, fellowship and reflection. Join us on September 21 -23 in Lake Placid. Go to the Men's Ministry table in Connection Central and register on Sunday. Price is $99. Join us on Wednesdays for our series "The Word Became Flesh." This is based on the book of John who speaks about the unusual, the outrageous, the difficult topics. The narrative emerges from the pen of the man who was closest to Jesus. 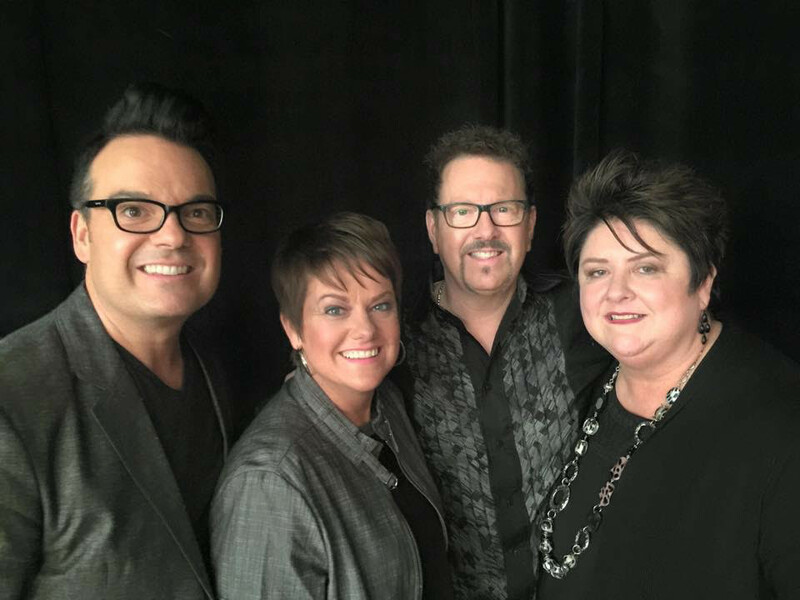 We are excited and delighted to welcome Dove Award-winning songwriter and artist, Geron Davis & Kindred Souls, as they lead us in worship on Sunday, August 26, along with our own choir and orchestra. 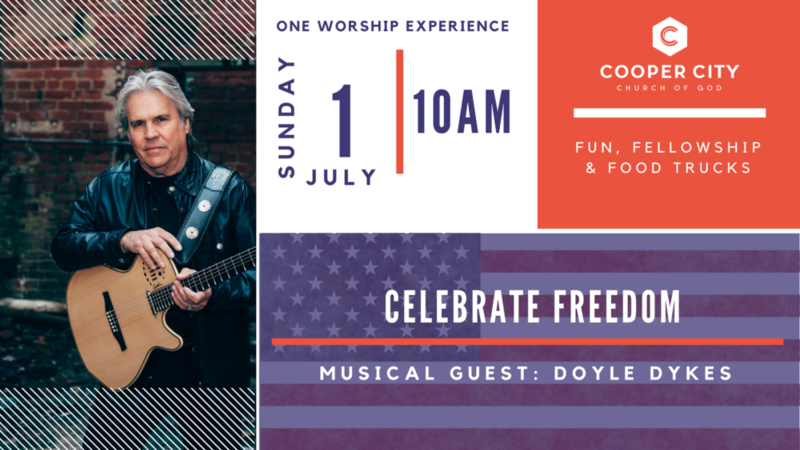 If you’d like to become a part of our music ministry, as a player or singer, or would are interested in become a part of any of our other Worship Arts teams, such as dance, drama or tech arts, then be sure and stop by the ministry table, located in Connection Central this Sunday , to find out more. BeYOUtiful exist to inspire young ladies 12 to 18 years old in their beauty, faith & life. The 2018 BeYOUtiful event is titled Be•YOU•nique & will focus on motivating each girl to embrace there God given beauty & potential. This free event is June 29th @ 7pm in Connection Central. Father's day is around the corner! 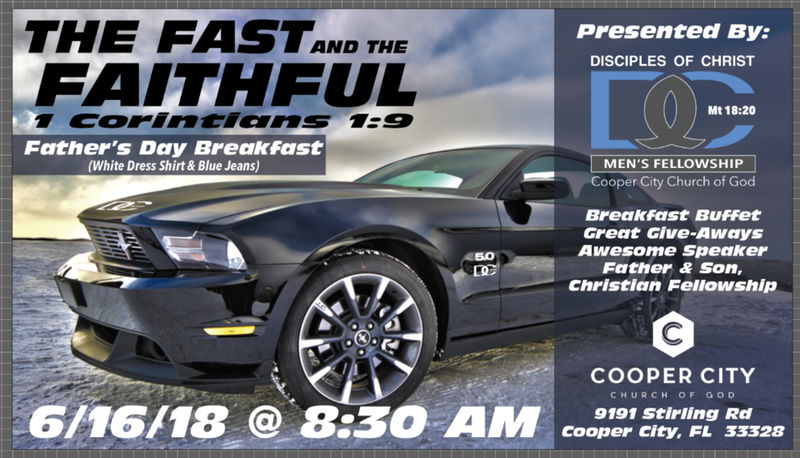 Disciples of Christ's invites men of all ages to the annual Father's Day "The Fast and The Faithful" breakfast on Saturday, June 16 at 8:30am. Go to the Mens Ministry table in Connection Central to purchase your tickets for only $10 or call the church office 954-680-9191. This year we are having a VBX Family Event for vacation Bible school. VBX is a Vacation Bible Experience for all ages, Fun music, Skits and breakout sessions for adults teens and kids. We will be having daily raffles for prizes and giveaways. Join us on Wednesday, June 13, Thursday, June 14 and Friday, June 15 at 7pm - 9pm (each night). Be sure and not miss one of our three dynamic worship experiences this Easter Sunday, April 1. As we joyously celebrate our victory through the resurrection and life of Jesus Christ, we will begin to consider some of life’s most thought-provoking questions--Where did I come from? Why on earth was I created, and for what purpose? Is there truly a right and wrong? This Easter, join us as we begin this 3-part series entitled WHY I WAS MADE, helping you gain certainty on these questions and more, in a life and world filled with uncertainty. Good Friday Service is on March 30. Join us at 7pm as we gather for the "Service of Shadows" for a one hour service. Kid City Kids are hosting our annual Easter Egg Event in the Next Gen Gym. 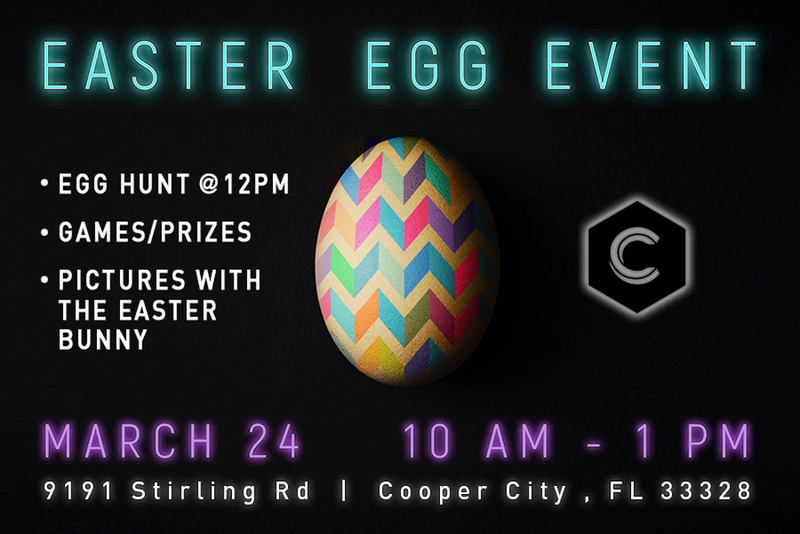 Join us for a morning of food, games, prizes and of course the BIG egg hunt. Make sure the kids bring their biggest baskets. Of course, our special guest the Easter Bunny will be available to take pictures. We can't wait for all of you to join us. This event is FREE and open to everyone in the community. Don't forget to invite your family and friends. See you there!